'Tis the season for holiday jobs. Hiring is well underway, and these 10 companies are bringing on the most seasonal workers. Macy's and Bloomingdale's stores ramp up their salesforce by nearly 50% ahead of the holidays, and this year, that means hiring 83,000 seasonal employees. The flagship Macy's (M) store in Manhattan will hire about 3,000 seasonal workers alone. Most of the positions are part time and may require work on evenings and weekends, not to mention Thanksgiving night. 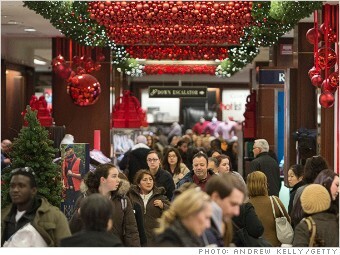 Instead of waiting until the wee hours of Black Friday, Macy's stores will open at 8 p.m. this Thanksgiving. While some retail experience is helpful, the company is really looking for "individuals with a great attitude who are enthusiastic about helping us serve customers," Macy's spokesman Jim Sluzewski said. Jobs are listed at macysJOBS.com and bloomingdalesJOBS.com.